Marcia Morrison, Ms. Senior Massachusetts 2018, spent months preparing for the national Ms. Senior America contest held in Atlantic City on October 18, 2018. 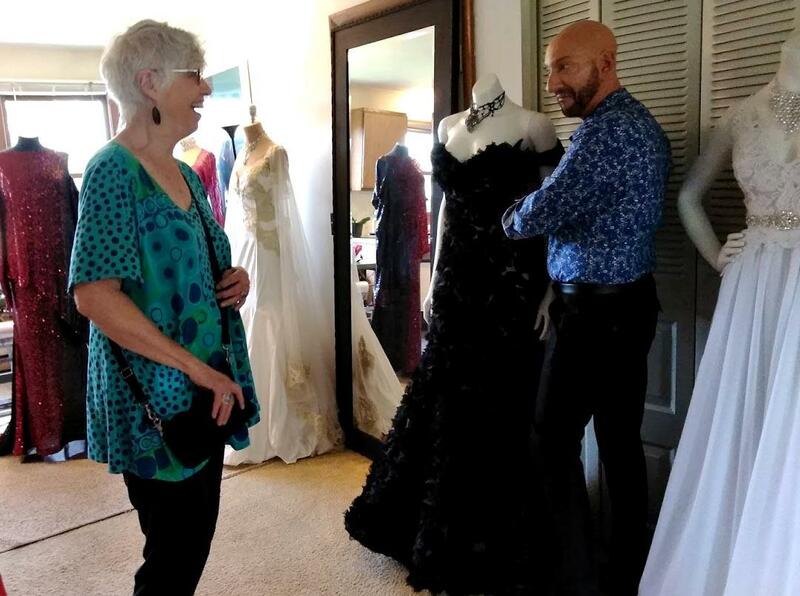 Dress designer Robert Donegan, owner of Robert Keith Couture in West Springfield, Mass., with Marcia Morrision, about a month before she competed in the national Ms. Senior America contest. A daily reminder of victory, at the Easthampton, Mass., home of Marcia Morrision, Ms. Senior Massachusetts 2018. Just down the boardwalk from last month's Miss America contest, the next Ms. Senior America was chosen Thursday from among a crowd of women over 60 years old, and some who are well over 60. Marcia Morrison, 72, lives in Easthampton, Massachusetts, and has been preparing for this event for months. One late summer afternoon, she spent a few hours getting her formal pageant gown fit at Robert Keith Couture in West Springfield, owned by Robert Donegan. Among other fashion tips, Donegan helped Morrison decide which earrings to wear with a red sequin gown he designed. "The line is just my style," Morrison said, looking at herself in the mirror. "And I really like the ombre. It's very elegant, which is what this pageant is all about!" The national Ms. Senior America Contest began in the 1970s. It's billed as "more than a beauty pageant," although contestants do spend hundredsof hours preparing the optics for a series of events, culminating in a final event when a new Ms. Senior America is chosen. The contest takes place a few hotels away from that other, better known beauty pageant, Miss America -- which is held next to the now-closed Trump Plaza. Though Donald Trump once owned a different pageant organization, he has no business connection to the Ms. Senior America contest. Morrison joked Trump has no interest in their varicose veins. Ms. Senior America winners of the past, and winners at the state level, have lived long lives and come to the contests with a variety of experiences. Some are breast cancer survivors. Some, when young, fled home during war. They are also retired social workers, business executives, entertainers and -- like Morrison -- educators. She retired five years ago as dean of arts and humanities at Holyoke Community College. Morrison's ability to sashay gracefully down a walkway will be worth a certain number of points, in a pageant she says she never thought someone like herself would take part in. Her involvement happened by chance during a workshop for aspiring cabaret singers. "This woman came up to me, who was in the workshop, and she handed me this card, and it said, 'Ms. Senior Massachusetts 2017.' Her name was Patty and she said, 'Please, consider this. Call me. I think you'd be great,' " Morrison said. Patty Liquore mentored Morrison to compete this spring in the state competition. Even with a career in the arts, Morrison said she had to learn how to speak publicly, wear stockings when she didn't think it was necessary and to behave "a certain way" in front of the judges. But she said she drew the line at wearing stiletto heels. "You know, I just had my hip replaced a year and a half ago!" Morrison said, laughing. "This is a senior pageant. I'm going to wear chunky heels." Chunky heels, appropriately covered in glitter. Dress designer Robert Donegan, owner of Robert Keith Couture in West Springfield, Massachusetts, with Marcia Morrision, about a month before she competed in the national Ms. Senior America contest. Morrison doesn’t appear to have lacked for a social life before becoming Ms. Senior Massachusetts. But she is now "one of the gang," a gang that calls itself the Cameo Club. It's made up of women who have either been Massachusetts queens before or are involved in the pageant in some way. "They're very supportive," Morrison said, "and they basically were there to guide me every step of the way." Since winning the state title, Morrison and Cameo Club members raised about $1,500 for the entry fee, and money for Morrison's travel costs and her pageant wardrobe -- a few formal gowns among them, but no bathing suit needed, ever. 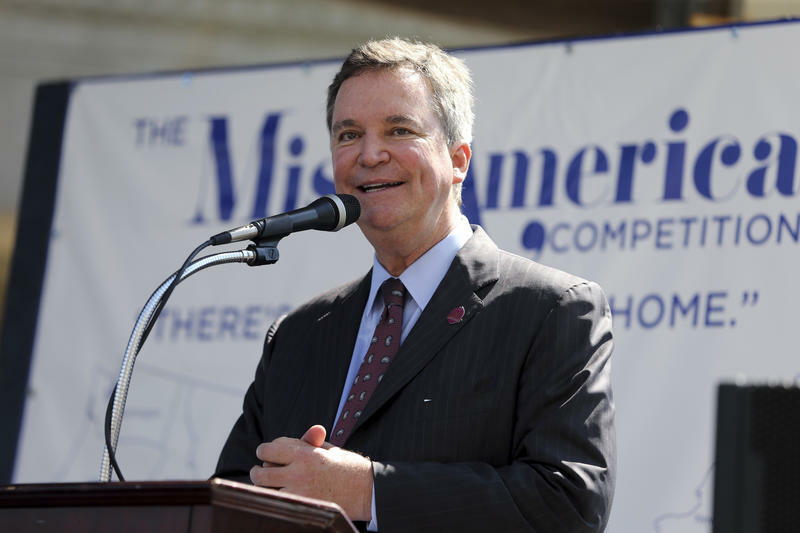 This year, as the #MeToo movement gained steam, the nearly 100-year-old Miss America pageant attempted to rebrand itself, cutting the swimsuit competition, and saying it will no longer judge women on their outward appearance. But Morrison grew up in a culture that objectified beautiful young women, and she said being judged based on how she looks in a dress has been a real challenge. "The whole idea of, 'Do I look OK?' -- because the look is part of it," Morrison said. On top of that, as she got ready for the contest, she said she wondered, "What was I going to say that hasn't been said before and that truly represents me?" Overall, judges score contestants based on elegance, talent -- Morrison will sing a jazz standard -- and a 35-second personal philosophy they read aloud. Morrison's is about the importance of telling your story, and asking people about theirs. It's how we can stay connected to people, she said, which is harder to do as you get older, retire, and your kids grow up. Morrison was a military brat and her family moved frequently around the U.S. She was always having to ask people about themselves, she said. Now, she does it for fun when she travels, and from behind the counter at a Northampton, Massachusetts, thrift shop where she works. She wrote her philosophy, she said, for the women who will be in the Atlantic City audience. Older women who may now feel invisible, she said. She doesn't include herself in that mix. She's a lifelong theater diva. "I wear clothes that attract attention," Morrison said, wearing a black-and-white print with cutouts at the shoulders. "That's kind of my way of saying, 'I ain't invisible honey!'" The competition at the Ms. Senior America pageant will be steep, Morrison said before going. But she will do her best. The Cameo Club has invested in her, she said, and she is their queen. At the pageant last week, Gayle Novack from Aurora, Colorado, was crowned 2018 Ms. Senior America. Morrison had said no matter what happens, she would continue with the Cameo Club. "I'll find other women out there who will graciously look elegant and showcase Massachusetts," she said. Miss America is waving goodbye to its swimsuit competition, scrapping one of its most iconic elements in an attempt to shift the annual ceremony's emphasis from its longtime focus on contestants' physical beauty. Many of the photos in Pablo Delano's exhibit at Hampshire College are more than 100 years old.